There are many ways to make money online and earning money with display ad networks is one of the most popular ways to earn money online. This method is as popular as affiliate marketing is but it doesn’t mean it’s super easy. Some people may agree with me while others will not. In their opinion earning money with display ad networks is much easier than affiliate marketing. 1.Is it real to earn money with Google Adsense? 2.Is it easy to earn money with Google adsense? 3.Is making money with Google adsense easier than affiliate marketing? 4.Is it easy to get approved by Google Adsense? 5.How to place Adsense ad on your website? 7.How much money can you earn with Google adsense? 8.Is it easy to get banned from Google Adsense? 9.Can I restore my adsense account if I got banned? 10.How long does it take to start earning money with Google adsense? 11.Is it worth making money with Google Adsense? 12.How does Google Adsense pay commissions? 14.What is the threshold with Adsense to get your first payment? 15.How to maximize your Adsense revenue? I did my research and found many articles about Google Adsense but I didn’t find a single post covering all these aspects in one post. So, I decided to write my post to help those of you who want to learn about Google Adsense and how to earn money with Google Adsense. Before I answer all those questions I want to explain briefly what Google Adsense means and how you are going to earn money with it. Basically, you need a website and once you have it you can apply for Adsense and after getting approval you place the ad on your website. It will be displayed on your website and when someone clicks on it you will be paid for it. 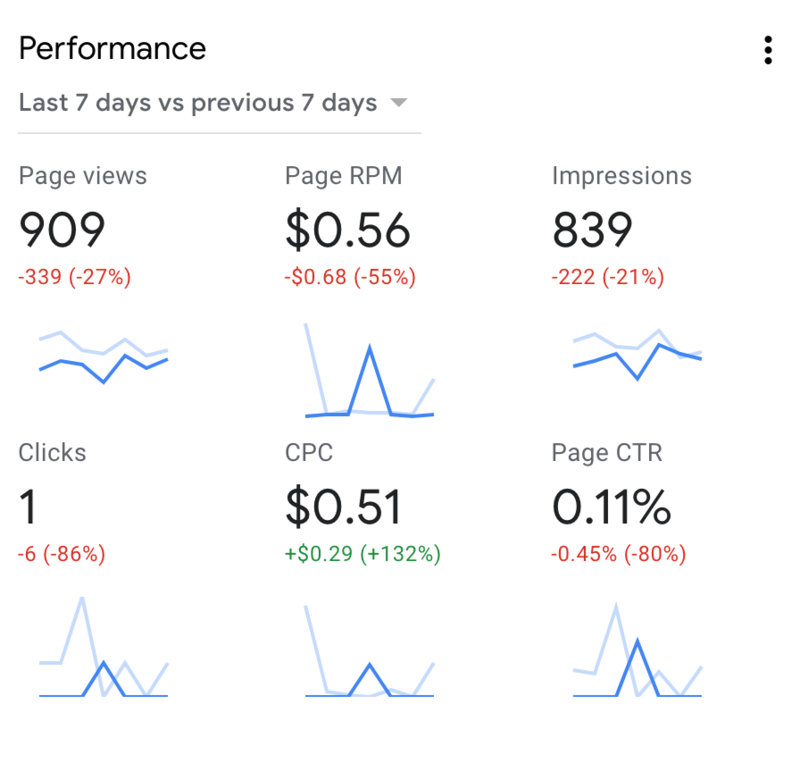 Normally, Google doesn’t pay a lot for clicks or impressions. But your income depends on the numbers of your visitors. The more visitors you have the more clicks you get and the more clicks you get the more money you can earn with Google Adsense. Generally speaking, once you have set up your website and have steady traffic to your business you can earn money on autopilot. But before that autopilot thing becomes the reality you need to put a ton of effort into your online business. 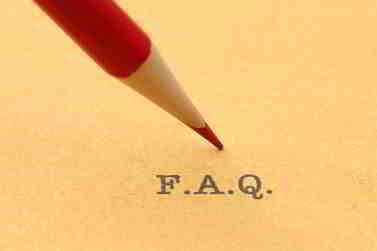 So, now I will try to answer questions mentioned in the list above. 1.Is it real to earn money with Google Adsense? Yes, it’s absolutely real. I recently received my first payment from Google. You can see my commission on the screenshot below. It’s $101. I know it’s not a lot considering that I earned it for several months. Because Adsense has never been my main activity. The idea is to show you that it’s real and anyone can do it. You don’t need any super skills to earn money online with display ad networks like Google Adsense. Plus once you have steady traffic to your website you don’t put any effort while you continue to earn money. 2.Is it easy to earn money with Google Adsense? It depends on how you look at it. Generally speaking, when you set up your website for the first time it requires from you a ton of effort to add quality content. The more content you have the more traffic you can get to your website. The more traffic you have the more money you can earn. This means you have to put effort before you start making money with Google Adsense. Probably, it will take months, up to one year or maybe even two years. Is it easy? Not at all. But once you have built traffic you will be making money literally on autopilot. You just need to add content to your site from time to time. That’s why there is no simple answer to this question. 3.Is making money with Google Adsense easier than affiliate marketing? In certain sense yes, it’s easier. Because you don’t need to search for products/programs to promote or create affiliate accounts or set up payment options considering that all programs have different payment systems. All you need is just create quality content for your website and wait for traffic to flood your site. Once you start getting traffic you will start earning money from Google. That’s why in this sense Adsense is easier than affiliate marketing. 4.Is it easy to get approved by Google Adsense? Again, there is no simple answer to this question. For some people it’s easy while for others it may become a huge problem. For me personally it was super easy. I set up my website, created content, around 100 pages, started getting some traffic, approx. 20,30 visits a day and then applied for Google Adsense. I got approval a few days later without any issues. Other people complain that they can’t get approval for various reasons. So, it really depends. 5.How to place Adsense ad on your website? It’s super easy. First, you go to your Adsense dashboard and get your code. Then you paste it into your post or page. Go to the “text” mode and paste it there. Alternatively, you can go to widget are and choose “text” widget and paste you’re code there. It’s recommended to place the ad on pages and posts within your content. It’s safe in terms of breaking Google Adsense rules and better in terms of higher CTR. 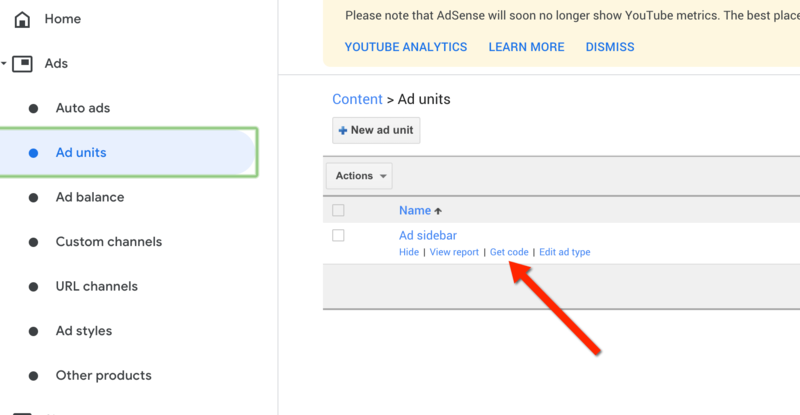 6.What is required to get approved by Google Adsense? From my personal experience I can tell that in order to get approval you need to do a few things. First of all, you need a website and you need to fill it with quality content. Once you have enough content and start getting targeted traffic from Google, Bing and Yahoo you can apply to Google Adsense. I think you will get approved. 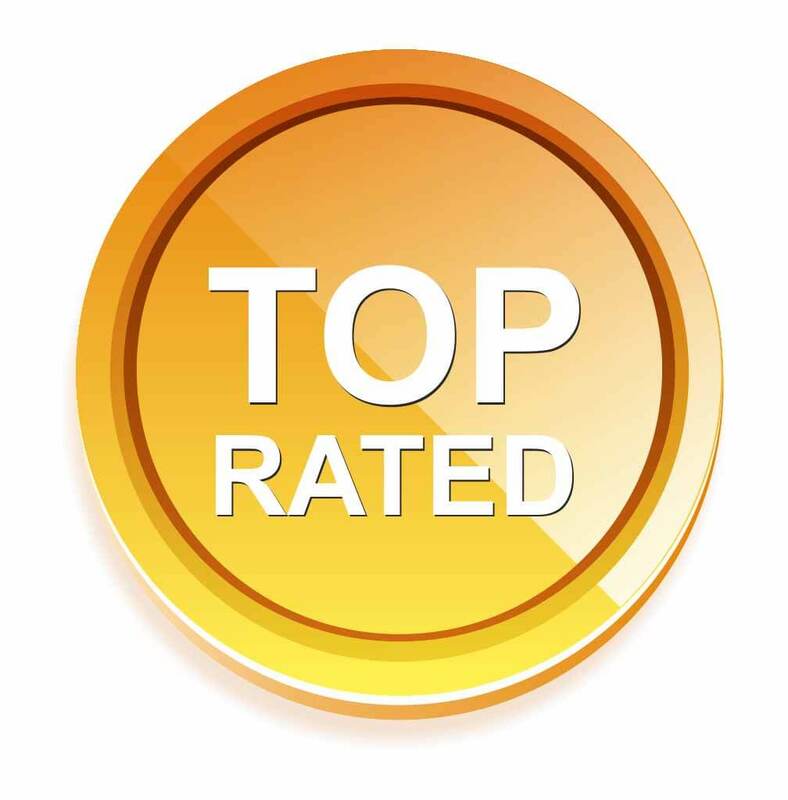 Before having content, good rankings and traffic I don’t recommend to apply for the program. Because without this you will most likely not get approval. 7.How much money can you earn with Google Adsense? It really depends how much you can earn with Google Adsense. My goal in this post is not to brag or mislead you in believing that you can earn $10,000 from Google Adsense. Only super high traffic sites can do it. But making from a few hundred bucks up to $1,000 or $2,000 per month is very achievable. A friend of mine is making even more. But he is affiliated with Mediavine.com, not Google Adsense. You must remember that Google Adsense is a display network program and normally an average cost per click is very cheap, a few cents per click, approx. under $0,10 per click. For example, as you can see above, I earned $101 from Google Adsense. I know it’s not a lot. But this is not my main income. My main income comes from other affiliate programs. Still, receiving $100 is not bad. When I received my first commission from Adsense I was very happy to spend it for my family. 8.Is it easy to get banned from Google Adsense? Yes and No. Again, there is no simple answer to this question. As I know, many people complain that they have been banned without any obvious reason. For example, a friend of mine from onemorecupof-coffee.com was banned from Adsense without any explanation. He sent them a letter but they didn’t explain anything. His friend also was banned from Google Adsense and received a letter saying that your account posed a risk of generating invalid activity. I also know that they have some very strict rules, such as for example, you can’t put Google ad on your website sidebar. To me it looks very strange. This is my website and I decide where to put the ad. What is the problem with placing the ad on the sidebar? I really don’t understand it. BTW, I have my Google on my site sidebar and my account has never been disabled. I know many other people are doing the same and their accounts have never been disabled. I believe it’s a better of luck. Some people get banned while others do not. Some times it’s very easy to get banned. Sometimes your account can stay for decades without any issues. But compared to other display networks like Mediavine, Media.net, Ezoic, Infolinks, it’s true that it’s very easy to get banned from Google Adsense without any further explanation. 9.Can I restore my Adsense account if I got banned? Unfortunately, there is now way to restore your Adsense account. You simply can’t do it. As I said above, if you get banned you get it without further explanation. If you get banned you don’t even get your earned commissions from Adsense. 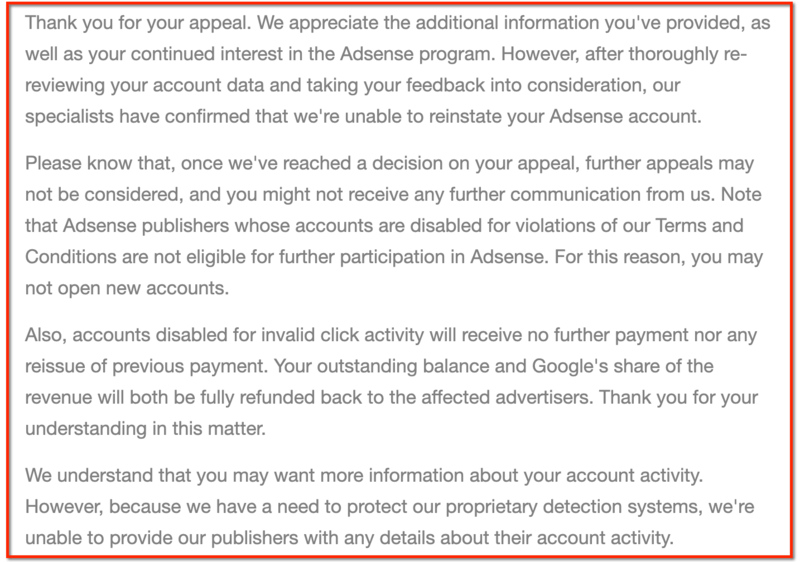 Here is an example of letter that you normally get from Google Adsense in case you try to contact them and ask to restore your account. As you can see clearly, Google says that: “you might not receive any further communication from us. See letter above. Note that Adsense publishers whose accounts are disabled for violations of our Terms and Conditions are not eligible for further participation in Adsense. For this reason, you may not open new accounts”. So, in this specific case there is clear answer from Google itself. You can’t restore your account! 10.How long does it take to start earning money with Google Adsense? It’s not difficult to answer this question. There is an answer to this question above, in my explanation to question N2. Most likely it will take one or two years before you can start making money with Google Adsense. Because before you start making money you need to create quality content for your website and get some decent rankings on Google, Bing and Yahoo. This will take time, probably 1,2 years or maybe even more. Decent traffic will earn you decent income. Good traffic will earn you a solid income. For a solid income you need to get 1,000+ visitors a day. 11.Is it worth making money with Google Adsense? 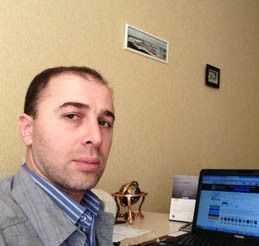 I think it is worth joining Google Adsense or other display networks, such as Ezoic or Mediavine. 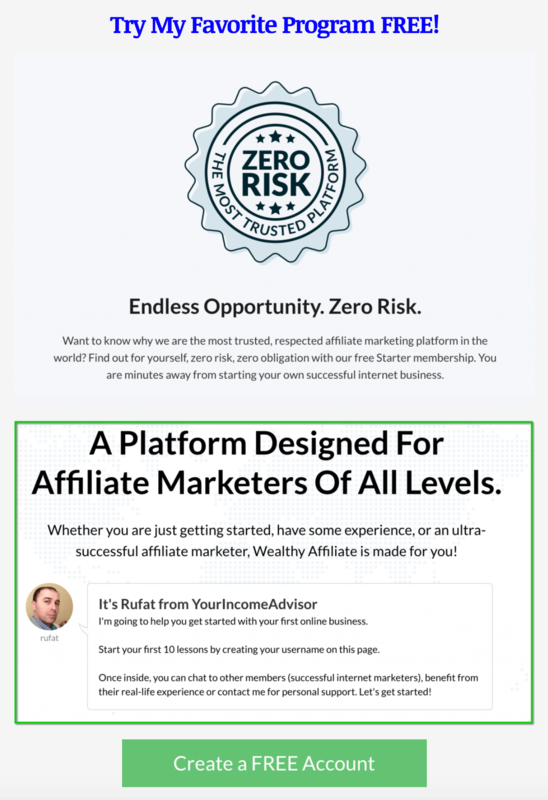 Ezoic is very affiliate friendly and help you increase your conversions. These networks pay more than Adsense but networks like Mediavine has some strict rules when it comes to accepting new publishers. If you get less than 30,000 visits per month they will not accept you. With Ezoic you can earn up to $100 per month even with a few hundred visits a day. With Mediavine your CPM can be as high as $20 CPM. Generally speaking, if you can get high CTR your cost per click CPC will be low and you can get more clicks which means more money in your pocket. Google will show your ads to advertisers more often if your site can give the lowest price per click. This depends on your niche, traffic and responsiveness of your audience to your ad placed on your website. Plus you can not only join Google Adsense to earn money. You can promote other programs on your website as affiliate and make even more money. At the same time you can run Google ads on your site and it will be a side income for you. It’s always better to combine affiliate marketing with earnings from display networks. This way you can have multiple income sources on your website. 12.How does Google Adsense pay commissions? Google Adsense pays commissions via international bank wire transfer. You can add your account details inside your Adsense account. I have two accounts, primary and secondary. 13.When does Google Adsense pay? Google pays commissions each month between 20-24. Let’s say you earned commission in September. You will get paid between October 20-24. BTW, the good news is that Google covers bank fees. For example, when someone sends you money via international bank wire transfer the bank charges you at least $20. When it comes to Google Adsense, Google covers this fee and you will get your commission in full. If you earned $100 you will receive $100. I think it’s great. 14.What is the threshold with Adsense to get your first payment? The threshold for Google Adsense is $100. You will not get your commission until your commission reach $100. 15.How to maximize your Adsense revenue? First, you can write more content and increase traffic to your site. The more traffic the more clicks you can get. Second, you can place more ads, up to three ads on your most visited pages. 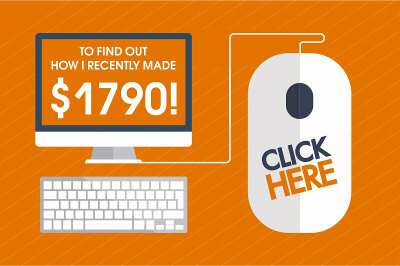 This will increase your clicks and revenue. But never put ads on pages that you use to promote specific products and make money from it. Promoting products as an affiliate will make you way more money than from Adsense. Third, you can insert your ads into your content. This can also improve your CTR and revenue. 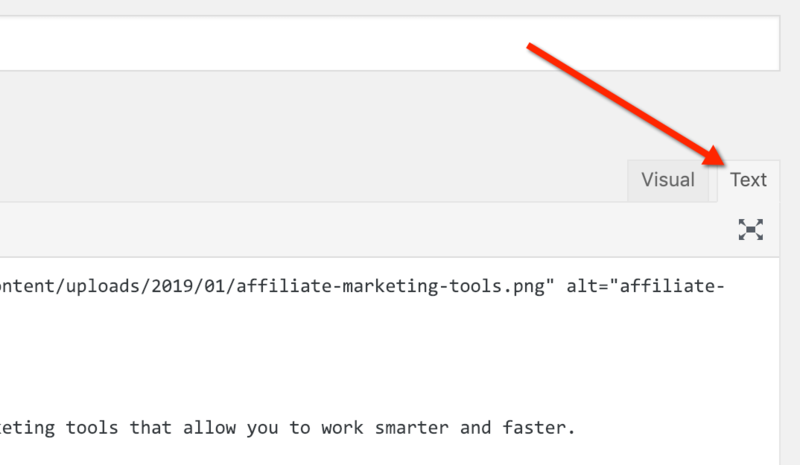 Forth, you can add your ad to your email newsletters if you do email marketing. For more details on how to improve your Adsense revenue read this post. Also, you can read success stories from Google itself. As you can see from my post, eating money with Google Adsense is absolutely possible. Earning money from Adsense has never been my main activity. I always focus more on promoting affiliate products/programs. If you want to learn how to build a website, build an online business, drive traffic to your website and monetize it with Google Adsense or any other affiliate program then create your starter FREE account below. It’s the same program that taught me and many others how to monetize a website. Feel free to ask questions if you have any and I will be happy to help you out. This is a great article about Google Adsens. This is my first time I read a this much of informative article about Adsens. This is a eye-opener for me. I learned a lot. Now I know when to create an Adsens account. I have just created my first website so I need to develop my website first before creating Adsens account. I never knew we can earn this much of money from Adsens. I will bookmark your website, I will visit your website in future. Thank you so much. I’m glad you learned something new from my post. I think once you start getting 20-30 visitors a day you can apply for Adsense account. I have read the whole review about this information.This is really a wonderful step by step guideline about how to earn money with Google adsens.Thanks you very much for This Guideline.This information is really very useful for me.I will share this article with my friends.Thanks again for sharing this informative article. I’m glad you found it useful. If you need any advice let me know and I will try to help. Hi Rufat! Thanks for writing on this topic. I have been looking for article on Google Adsense that can explain in detail the process of earning through Google Adsense and this article just did that. I know that making money with Google Adsense is not that easy, that’s why I have been looking for an article that will break it down in simpler terms. Your article is quite helpful and informative. Thanks a lot, keep up the good work. Yes, making money with Adsense is not easy at all. I’m glad you now have the idea and know what to do and what to expect from this method. I believe if you follow the steps laid out in the article you will have no problems with Adsense approval and making money using this method. I actually forgot I had Google Adsense on my website and when I checked I was pleased to see I had made $16.00 in a few months! This is huge because it is just there- I don’t necessarily do anything except create me content and put myself out there.I just applied for another website, but I am afraid that I do not have enough content on there yet and it may be denied. If it is denied, may I reapply after a while (after I have more content)? Thank you for clarifying so many valid points, I surely appreciate it. Great news Ciara. My congrats. I know this feeling.Yes, you can reapply at any time. You can’t if you got disapproved. Try to create content and start getting at least 20-30 visitors a day and then apply for Adsense. You will better chances for approval then.